Can you talk about your path to UCI and decision to study informatics? My path to UC Irvine started at Valencia High School in Placentia, Calif. I was originally planning on becoming a doctor — more specifically, a radiologist — but I was always interested in technology. I took both AP and IB computer science courses in high school, allowing me to get my feet wet in Java coding early on. 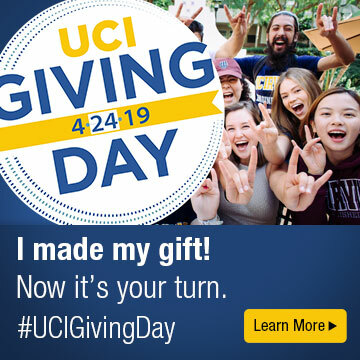 Wanting to stay local and commute from home, I applied to multiple UC schools in Southern California and, after much consideration, I registered at UCI. I was admitted as a biology major, but by the end of the first quarter, I knew I wanted to switch. However, my parents convinced me to stick with it another two years. I did not enjoy the majority of the subject work, and eventually I took the prerequisites to transfer to the School of ICS. I was originally planning on majoring in computer science, but based on the coursework I had already completed, a counselor encouraged me to look into informatics. I took her advice and transferred into the major with a specialization in health informatics. Around that same time, you started working at the Apple Store, correct? Up until I switched majors, I was working at the UCI TechHub, but in Fall 2015, I applied to work at the Apple Store in Brea to be closer to home. I went from working under 15 hours a week to working, on average, 30 hours a week as a technical expert in the Genius Bar. I wasn’t prepared to juggle work, school, commuting and church, and I failed ICS 33 twice, which academically disqualified me from both the School of ICS and UCI entirely at the end of my third year. I remember exactly when I received the email notification. I was in a server room in downtown Chicago. I had been helping my uncle run his IT business while he was on vacation, so I was by myself and feeling completely helpless. I saw no way to get back to UCI to complete my degree — I felt like it was game over. Yet now you’re graduating. How did you earn your readmission to UCI? As soon as I returned from Chicago, after exploring my options and speaking at length with my parents, I scheduled an appointment with the ICS counselors. Based on their advice, I took classes through ACCESS UCI and at Fullerton Junior College for the next year and a quarter. I was lucky to have tuition reimbursement through work, which I used to pay for the ACCESS classes — with help from my parents. Every quarter was a struggle, waiting until the end of the second week to register and hoping there would be available spots. It was a difficult and depressing year, but also very fulfilling, and I was officially readmitted during winter quarter of my fifth year in school. I cannot begin to say how lucky I am to have made it through the process, somehow coming out a better student and finally taking ownership of my faults instead of blaming my environment or family for pushing me in the wrong direction. It has not been easy juggling work and school, but learning how to balance both has taught me to plan things in advance and to work iteratively rather than last minute. I thought I was invincible before starting at Apple; any time not spent working felt like a waste. Understanding that balance between work and school can mean the difference between failure and success. Looking back, what has been the best part of your experience at UCI? Aside from the academic curriculum, the best part has been the support of the ICS counselors. From my first contact with them when switching my major, to the uplifting and nonjudgmental attitude they held during the readmission process, they never hesitated to extend a helping hand. Being a commuter, I had a bit of a tough time building relationships on campus. The help and encouragement I received from everyone in the counseling office was just what I needed to continue on with the work I needed to do. What about a favorite class or professor? My favorite class was Informatics 121 – Software Design I, taught by Professor André van der Hoek. I enjoyed this class and Professor van der Hoek’s teaching style so much that I wrote a short paper on him and his work for my ICS 90 credit. After graduation, I plan on working for Apple full time and then interning for Apple Corporate in a software engineering or cybersecurity position. In addition, I have been interested in law for a long while now, and I plan on taking the Law School Admission Test (LSAT) after getting some experience in the software industry. Find a solid group of friends through class or extracurricular activities to give you support. I was lucky to have my family, but if you’re living on campus — those friends are your new family, at least temporarily! Also, find a field you like. UCI has a plethora of options that let students experiment with different fields instead of just diving in head first and finding out results later. If you’re not completely set on one major, investigate and research things before settling on a course of study. Finally, time management is the most important thing, and this extends to every part of life, not just school and work. Making sure you plan realistically, keep yourself focused and leave time for yourself can ensure a smooth and fulfilling college experience.